Perhaps no generation understands this promise better than the one entering college right now. Today's students are standing up and demanding a more responsible use of our precious water resources. It's why greater number of universities are requiring the use of refillable water containers on campus. 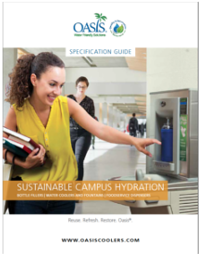 Some schools even issue a reusable water bottle to each incoming freshman. Luckily, Oasis makes it easy to join the campus sustainability movement. WATER IS THE PUREST FORM OF HYDRATION. OASIS KEEPS IT THAT WAY. PROMOTES THE SUSTAINABLE USE OF WATER. COOLS AND PURIFIES WITH MINIMUM BURDEN ON THE POWER GRID.